As we get ready for our 7th annual Open House and Art Sale – Friday, Dec. 5th, 4pm-8pm and Saturday, Dec. 6th, 10am -4pm, we would like to give you a chance to get to know the artists that will be featured. Three words to describe my work is hard because it covers a lot of territory. So here are three general words: passionate, joyful, colorful. 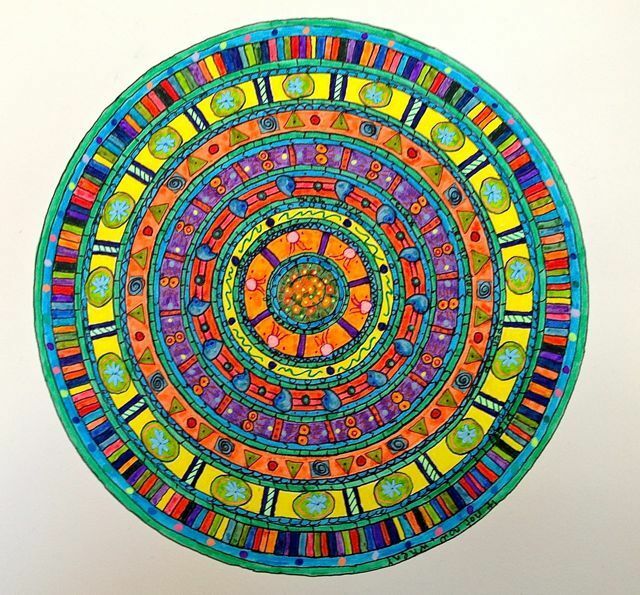 You will find mandala art: giclee prints (including two new images – Joy and Creativity), coasters (including a new set), platters (including the two new images), and cards. Baskets made of all sizes made of materials including seagrass, fiber rush, waxed linen, sweet grass, raffia and more. Paper vessels, and paper ornaments. Beaded bracelets of three varieties. It sounds a bit crazy and overwhelming even to me, but I love making all of it! Everything about creating anything and everything excites me. Maybe that’s why I can’t seem to stick to just one thing. When not making art, you will find me in the garden. Luckily out here (I live on Orcas Island, WA when not in the Poconos), that is for about nine months a year. Travel! Keeping my energy and health as long as possible. Being a better person. Doing more Reiki on Orcas. This entry was tagged coasters, giclee prints, mandalas, susan bradford, susan bradford art, tempered glass platters.